in coping stress and daily annoyance. The decision lies on the user. Moral support of the family can be of great help. Good thing I never started the habit so I don't have to quit. It's good to hear that there are men like you who never tried to smoke at all. I was lucky enough to be strong willed when I was in high school and college so I didn't yield to temptations before. NICOTINE is far more addictive than any substance that's why more smokers prefer to face the consequences of smoking and forget about the risks. My father and brother had that battle too and they won. If they can, then I don't see any reason why others can't quit. If others can... why can't they? But, still others have a difficult time accepting this reality. It's never easy to quit something that you are addicted to, whether it be smoking, drinking or even the games we often play in Facebook. But it's a matter of determination and the person's willingness to quit such a habit. Of course, the people surrounding you will also help. If the government really want to help this no smoking campaign, I really think that they should apply high tax rates for addictive products (cigarettes and alcoholic drinks). If it's not easily accessible, especially to teenagers, then they will think twice to buy it. I agree with you. Cigarettes are easy to buy. They're everywhere. Nabibili kasi ng patingi-tingi kaya kahit mga bata, pwedeng bumili. There's no law that can bring a vendor to jail once he sells yosi to minors. I know how hard it is to quit smoking especially if somebody's been doing it for a long time. But if one is really determined, then I guess it is possible. How I wish users have the courage to stop... and if ever they do, I'm sure tobacco industry will finally meet its downfall. I am not a smoker (never have and never will), but I do know some people who are chain smokers. I feel bad for these people because they know it's bad, but they can't shake off the habit. :( I know it's easier said than done. However, knowing how harmful it is should be enough reason for one to try and quit the habit. 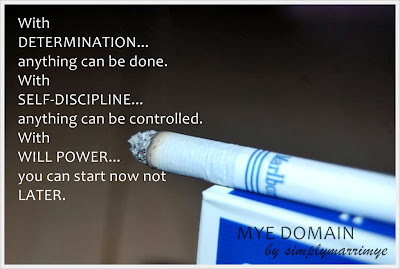 Quitting is a long way process but its something that can be done so I hope smokers get encourage by your post to quit. I am glad that DAVAO CITY campaign for SMOKE FREE DAVAO is SUCCESSFUL. Up to now our leaders strictly imposing this RULE. This is one of the things that I never bothered to spend money. I grew by the thought that smoking is burning money and I don't want that. Easier said than done. But with intimate determination and self-discipline getting rid of cigarette smoking is attainable. I really need some WILL power at this moment. Where there is a WILL , there is a way! Never considered smoking. Why waste money on something that will make me sick and make me smell bad? Even the "social status" it used to provide to smokers have been replaced by a more predominant public disapproval. I quit about 9 months ago. It was painful, and I felt terrible for weeks - now I feel better than ever. Thanks for encouraging people to quit this nasty habit with your blog post! I actually tried it once, but i dont like it. ive been forcing my friends to quit as well. sad...how i wish it is that easy to convince them each stick shorten their lives... but nothing scare them until it's too late.. I got a hard time to quit smoking during my call center years. But I was able to overcome it, when I got sick big time and that was major turning point. But now I'm better off without smoking. It's just a matter of brain over matter. My father was a chain smoker. according to him, he smokes 2-3 packs a day when he was young. i can still remember i used to see him smoke a stick or two when i was young. but i started to complain on the smoke at home so he decided to quit. thank God! I've tried every way I know to get my dad stop smoking. But believe me, nothing worked. I guess its a matter of choice. And since I cannot get him quit it, I just make sure his lungs are still okay by a monthly checkup. Haha! So far, I don't smoke as frequent as I used to. I just do it only on heavy drinking sessions (that keeps me sober from alcohol). YES! Act now before it is too late. I am anti-smoking talaga! I really thank you for this post, we must protect our body, life is short after all, live it up! Amen. I also strongly believe in the God factor in helping people quit. I've seen it in a lot of my friends. They gave their lives to Christ and the addiction amazingly went away. I am so fortunate that no one in our family smokes. Even my boyfriend and my circle of friends don't.. :) Anyway, I wish those who smoke will realize that it's not too late yet to stop. They need not waste their lungs and their lives just to get a little pleasure from smoking. I have heard from friends that smoking is really hard to quit but if you truly focus, discipline and mind over other things, smoking can be eventually avoided.